Olney-ace Pete Hawley could hardly believe it when his 80 peg Bedford Hospital open catch bottomed-out a set of 20lb scales. 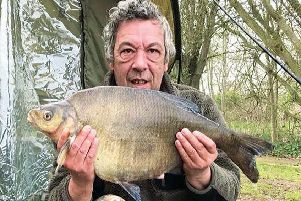 But there was no mistake...and he was the clear winner – picking up more than £500 – with 20-10 from the newly re-opened ‘brook swim’ on the Ouse. He used bronze maggot on a five metre whip to hand and put some 500 fish, mostly small dace, in his net. Paul Caton made second with a 14-8, largely roach, net. Despite the chilly nights winter is still some way off...so Alec Stageman’s 6lb chub, from MKAA’s Ravenstone Ouse, is a cracking summer fish. Adam Short had a nice 5-11 at Olney. The £5,000 appeal to help resurrect canal roach fishing has already raised more than £1,000 from anglers. If you can spare it, the equivalent of a couple of pints of maggots will help – please go to Canal River Trust home page, click on appeals and then ‘roach restoration’. Or call 0303 040 4040. Efforts by Oakwood AC to set up a replacement for the now apparently defunct Southern Canal league saw eight crack teams holding a ‘trolley’ on Manor Fields cut, Sunday. Maver MK won with 28 points (two up on Oakwood and three ahead of Black Horse). Maver’s Lee Jones was top individual, 10-7. With one round to go Bob Gale leads MKAA’s individual league with 67 points to Kevin Osborne’s 62. The latter won Saturday’s canal leg with 6-3 as Gale had 2-15. Fishing the Tackle Hub syndicate lake, eight North Bucks Society of Disabled Anglers members raised £545 for Willen Hospice. Alan Mann won with 9-2 ahead of Stan Bartlett, 6-4. MK Vets, Lodge Lake: Ray Baker 25-4, Mick Reynolds 24-15, Ernie Sattler 21-6. Calvert, Claydon Lake: Dave Lewis 9-11, Ron Hillier 2-2, Barry Witteridge 1-6. Kingfisher, Linford Lakes (used at short notice, thanks to the owner’s help): Paul Hack 6-11, Bruce Harvey 5-1, Keith Harrison 4-9. Linford, Bird’s Bridge cut: John Hough 5-6, Mick Hefferon 4-2, Roy Hefferon 3-5. MK Festival, ladies, Tear Drops: Nuala Gray 7-8, Kitty Gregory 6-8, Helen Vickers 2-2. Fixtures: Saturday, junior MK Festival match; Bletchley canal, 01908 320007. Sept 20, Olney’s Citizen Cup, Ouse, 01234 240061, £500 first prize; Sep 25-27 Furzton Festival carp pairs match & Nash roadshow, 01908 313158; October 4, Towcester open, Castlethorpe canal, 01908 563617 after 4pm.